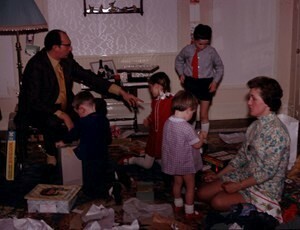 It is chaos on Christmas morning as the children discard wrapping paper in a an attempt to uncover what Santa has left for them. In this picture, right, there is a Matchbox Motorway 'M2' set. Model racing cars were always a favourite Christmas present for boys. 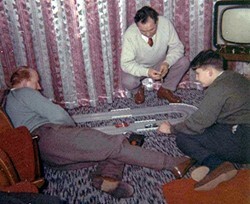 Here, in the photograph on the left, father, son and uncle get down to some serious racing with a Scalectrix set from the 60s. I wonder how much the popularity of these Scalectrix and other slot car racing games were boosted by the adults wishing to play with them. It was much less acceptable for grown men to play with toy racing cars in the 60s, than it is today. However, there were already slot car racing clubs for adults in the early 60s. Other favourites from the sixties and seventies included Mecano, Spirograph, Sindy, Action Man, Etch-a-Sketch and the Space Hopper. Christmas gifts say much about the giver and receiver, but what do gifts from the past for adults say about how we lived?